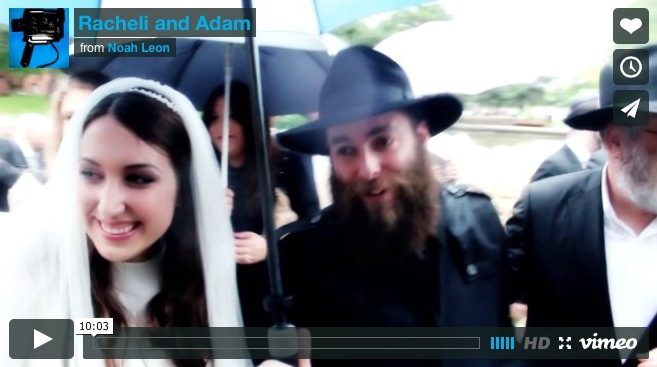 Racheli and Adam from Noah Leon on Vimeo. This was a traditional Hasidic wedding between a beautiful couple, Racheli and Adam, that took place here in Montreal. What made it unique, besides the people involved, was the incredible downpour which happened just as the Huppa began. It turns out that in Judaism, rain on your wedding day is a blessing, and certainly blessings are what everyone wishes the new couple. I lost a camera due to the rain and being unprepared. I have a rain cover, and had to dash in halfway through to grab it and my backup camera when my trusty T2i shorted out, then dash back outside. Thankfully, Canon has a wonderful service program where they will fix almost any problem for under $200. They even replaced the worn rubber on the hand grips.